It’s July 1, which means we’re a third of the way through winter, halfway through the year and one day into Dry July. Only 30 days to go, but who’s counting? If you’re anything like me, the prospect of giving up booze for a month is a little daunting. Quitting alcohol, even for a month, can be hard and yet thousands of Australians sign up each year to ditch the drink and raise money for a good cause, whether it be through Dry July or similar campaigns like FebFast and Ocsober. Putting charitable intentions aside (which are a great reason for getting on board), many people sign up to give their body a break from alcohol. But can a month of sobriety really lead to any meaningful changes when it comes to your health? If you’re a regular drinker, taking a month-long break from booze is likely to bring about some health benefits in the short-term, including improvements to your sleep, the National Drug Research Institute’s Steve Allsop says. That’s because the sedative effects of alcohol wear off after just a few hours, increasing your likelihood of waking up prematurely. Alcohol also makes sleep problems like snoring and sleep apnoea worse. “The other reason alcohol can impair quality of sleep is if you’ve drunk quite a lot, you might be getting up all night going to the bathroom,” Professor Allsop says. When morning does arrive, moderate to heavy drinkers (who are abstaining from alcohol) will find they wake up without the effects of a hangover. According to Julie Robert from the University of Technology Sydney, this can lead them to pursue activities they otherwise wouldn’t. “With one productive change, people are often more willing to make changes in other areas,” says Dr Robert, who researches temporary sobriety initiatives such as Dry July and FebFast. And as drinking is often a social activity that relies on more than one drinker, Dr Robert says abstaining from alcohol can also have a “halo effect” on those around you. “What we hear from people is that because they’re not drinking, they might do other social activities [that don’t involve drinking] … so the behaviours of their loved ones and friends may also change,” she says. The high-calorie content of alcohol means cutting your intake for a month could result in weight loss. It also gives your liver a rest, especially if you tend to drink above low-risk levels. “You might not have any overt signs that you’re physically better, but your liver function will begin to improve fairly quickly,” Professor Allsop says. While a month of sobriety may create some positive change in the short-term, it won’t do much to lower your lifetime risk of harm from drinking alcohol — most of which arises from chronic use. The get this benefit, you need to limit your alcohol intake over long term. 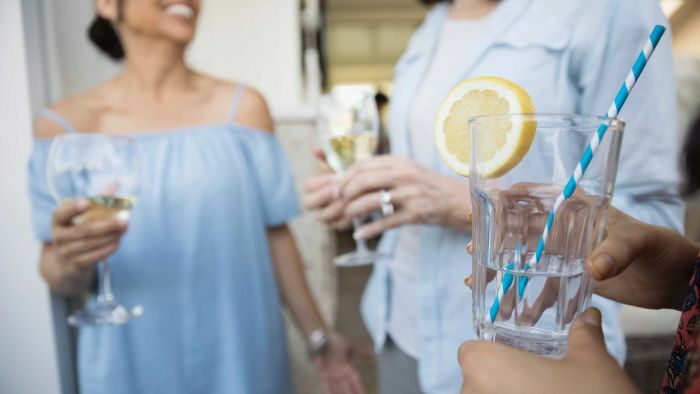 “If you’re regularly drinking at levels that increase your risk of cancer, having a month off won’t make much difference to that risk,” Professor Allsop says. In Australia, the National Health and Medical Research Council recommends drinking no more than two standard drinks a day, and no more than four standard drinks on a single occasion. By doing so, you keep your lifetime risk of death from alcohol-related disease or injury below one in 100. As for whether campaigns like Dry July lead to long-lasting changes in alcohol consumptions habits, it’s hard to say. There’s been little scientific research into the long-term effects of taking one month off booze. “Some UK research has shown that in the immediate week to one month after, as well as six months after, people report that they are drinking less,” Dr Robert says. While not everybody needs to make long-term adjustments to their drinking habits, research shows many of us underestimate how much we drink. “For a lot of people, alcohol is ubiquitous, it’s everywhere,” Professor Allsop says. Professor Allsop says taking a break from booze may provide people with an opportunity to pause and reflect on their relationship with alcohol, and the effect it may have on their health, productivity, and relationships. “For a lot of people, it’s an opportunity to realise that alcohol is almost an automatic feature of some or sometimes many aspects of their life,” he says. He says taking a break can also highlight the social pressures many of us are under to consume alcohol. “There’s incredibly overt and sometimes subtle pressure on us to drink,” he says. “We seemingly don’t need a reason to drink, but we often have to have a reason not to drink. “Whether it’s real or imagined, there is this sense of you have to have a reason. Come the end of July (or any period of abstinence), Professor Allsop says there is a risk some people may engage in binge drinking that results in a few days of “heavy intoxication”. “If it becomes an excuse for subsequent binging, then not only is it not particularly useful, it may actually increase some risks,” Professor Allsop says. It’s also important to note that campaigns like Dry July do not work for everyone and may exacerbate difficulties for some people with alcohol dependency. “The primary purpose of Dry July is to raise some funds. It’s not a public health campaign,” Professor Allsop says. At the end of the day, improving your relationship with alcohol is about making long-term adjustments, understanding what the risks are for you individually, and understanding the role alcohol might play in your life, he says. “It’s about enjoying alcohol for all the reasons you might enjoy — the taste, the conviviality, the symbolism, whatever it might be … not assuming that coming off it for a month once a year is going to undo all the risks of cancer or liver disease or cardiovascular problems,” he says.